A 45-foot-long polystyrene sculpture called The Swimmer ended a weeklong stay in London's St Mary's Gate, Greenwich Park last week, and was shipped off to Chiswick. 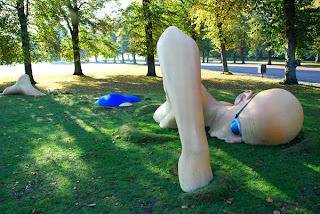 The piece had been exhibited in Greenwich Park to draw attention to, or promote if you like, the WOW reality series London Ink, which follows the adventures in the skin trade of Louis Malloy, the inker who put "the world's most famous tattoo" on David Beckham's back, and his team of artists. London Ink airs Sundays at 10PM on Discovery Real Time in the UK. 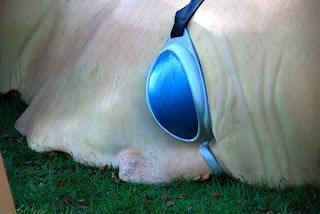 And we just happened to stumble across this thing on its first day in the park, blissfully unaware of its intended transience. I struggled to see the promotional value of the piece I must admit. In itself it was mildly amusing, and very well executed although it needed around the clock attention from two security guards, who set up camp in their car for the duration. This fact in itself speaks volumes for its durability as a piece of public art, or perhaps it speaks volumes of the target audience for the programme. If it hadn't had a plaque explaining its purpose, we would never have known of its apparent significance in the world, but there again we don't actually recall ever seeing David Beckham's back either. We didn't even know he'd been away.